School districts are turning to local referenda as alternative funding to deliver needed services. School referenda are a mechanism to fund local projects and operational costs, and they have increased in popularity in recent years. The connection between quality public schools, workforce development and a healthy local economy all factor into the success rate of referenda. According to Indiana Education Insight, over the past five election cycles 42 out of 48 referenda have passed statewide compared to only half in prior elections. The ballot results reveal a need for local tax dollars to supplement school funding as well as a willingness among voters to support their community public schools. The growing reliance on referenda results from the elimination of the school general fund property tax in 2008 – equating to a loss of more than $1 billion in local taxes for school operation – which placed the responsibility of funding public education solely on the state. Then, the Great Recession hit. State revenues plummeted, and schools took a $300 million hit statewide. Those funds were never restored, and despite modest budget increases by the General Assembly, schools remain funded at 2009 levels when accounting for inflation. “There is less and less money coming in from the state every year,” said Oregon-Davis CTA President Maggie Vogel, whose local helped pass a referendum this year. 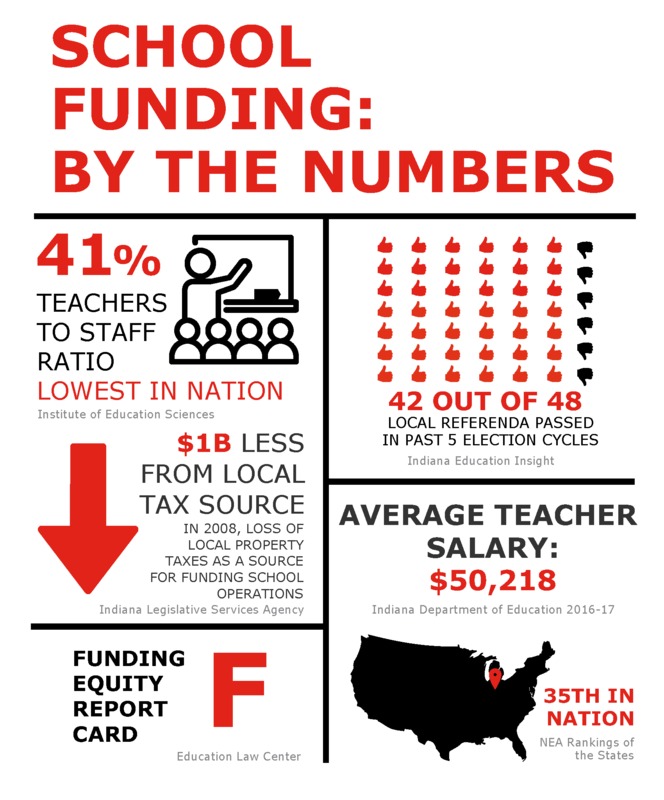 Stagnant or reduced funding for targeted categorical programs means larger class sizes, forced layoffs, elimination of curricular programs like the arts and physical education and rollbacks in employee benefits and salaries – all of which threaten public schools and worsen the teacher shortage hurting Hoosier kids. “The referendum was a necessity to keep our doors open and the hope of improved teacher compensation in the future,” said Vogel. In 2017 – 18, there was a revision to the school funding formula, which has resulted in the state’s most affluent districts receiving nearly the same as those serving low-income families. There are 12 school referenda before Hoosier voters in November. Learn more about each from the Department of Local Government Finance. Many rural and lower-income districts are hardest hit. A report by the Education Law Center gives Indiana an “F” for funding effort. Until legislative actions are taken to replace funding levels, more communities will be asked to support school referenda. To read more about school funding, check out ISTA's Advocate fall issue.